Dressing a container is a vital part of the packaging line as this will be your presence in front of your customers.With this in mind Enterprise Tondelli are able to supply the full range of automatic labelling machines from slow speed; 250 containers per hour to very high speed typically 60,000 bottles per hour. Over the years a wide variety of containers have been handled from 120 ml cans to 500 ml glass bottles to 2 litre PET bottles to 15 litre polycarbonate cooler bottles to 50 litre kegs with everything in between. Cold or Wet glue labelling either in line or rotary. 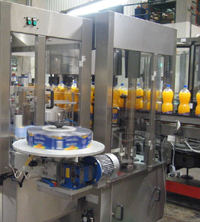 A rotary machine can have a number of label stations to suit the required application. Inverted “U” strap excise labellers with hot melt/wet glue or self adhesive/pressure sensitive labelling. Reel fed plastic or paper labelling using a rotary machine from 4,000 to 48,000 bottles. 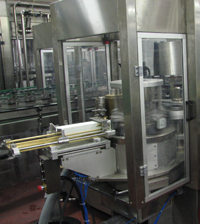 Labellers featuring servo motor technology under the bottle platforms to allow optical spotting and precise bottle turning able to cope with variations. Special universal rotary wet glue labellers for slow speed multi product lines with adjustable label magazines and without the need for change part glue pallets especially suited for contract packers. Combination labellers with a number of different glue types and stations mounted on it. For instance reel fed plastic wraparound labeller with a self adhesive promotional sticker or a machine for wet glue stations as well as pressure sensitive labelling on the same carousel. For instance a glass water bottle with cold glue body and wraparound neck and neck label with a self adhesive or pressure sensitive tamper evident inverted “L” strap over the cap. Our automatic label applicator manufacturer has vast experience in this field and has a solution to suit your every requirement – Enterprise Tondelli supply from single machines to complete filling and packaging lines.